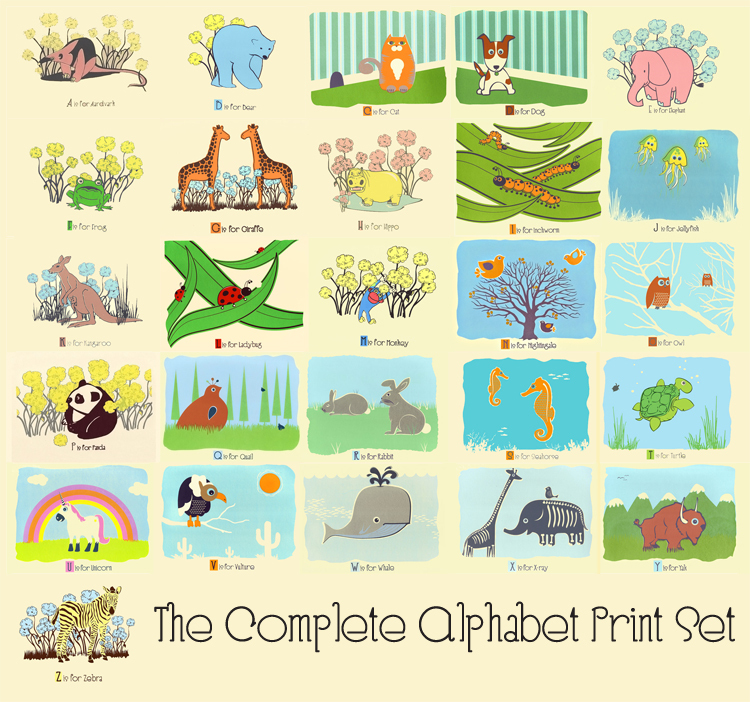 Animal Alphabet Nursery Art Prints, hand screen printed. Shazam! This is the whole shebang! The entire hand screenprinted Alphabet Print set, letters A-Z. That’s 26 prints! Feel free to peruse them all listed here on Etsy in the “Alphabet Prints” section. You get one of each letter in the full set. My Alphabet Prints are all 2 to 7 color screenprints, all hand printed & signed by me. They are printed with a wide range of soft colored, water-based acrylic printmaking inks that appeal for both girls, boys, and grown ups of all ages. Edition: Open, with each print hand signed, and titled. – Size: 11 x 14 inches (27.9 cm x35.6 cm) I love the deckled edges of Stonehenge so I leave the deckle edges at the top.